I know it sounds funky, but you’ve got to believe me, these omelettes are delicious. I make a lot of soup, and usually, there will be just a little soup left over, too little to be a serving, but too much to throw away in good conscience. One day I thought I’d drain the broth from some leftover soup and use the rest in an omelette. But I’d left more broth than I had planned to and it turned out to be a fortuitous accident. The broth gets under the eggs and quickly comes to a boil, and since the eggs will be only partially set when you add the soup, the boiling liquid will give the eggs a light frothy texture. I’ve made omelettes with vegetable beef, ham chowder, and albondigas soup, and all have been great. I make my soup pretty dense with ingredients, so there are plenty of vegetables and meat to make a flavorful and satisfying omelette. Heat up a pan over medium-high heat, then melt the butter in the pan. Add the eggs, sprinkle with salt and pepper to taste, and allow them to set a little, for about 45 seconds. Gently pour the soup over the eggs. If the broth doesn’t make it underneath the eggs on its own, use a spatula to push the edges of the omelette towards the center a little, and poke a few holes through the eggs to get some broth underneath. Sprinkle the cheese over everything, and cook until the eggs are done. Try your best to flip the omelette in half, like you would any omelette. 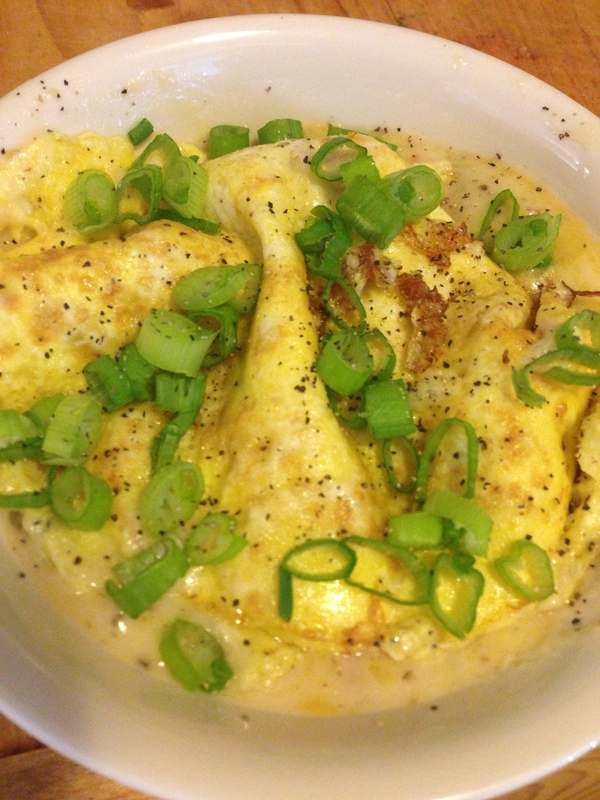 Tip the omelette and remaining broth into a bowl and top with green onions.